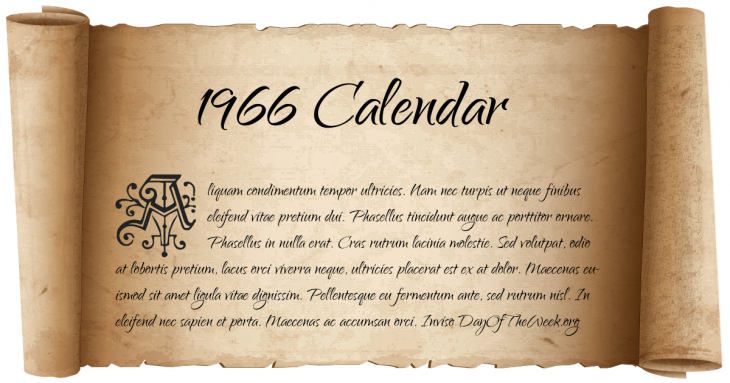 January 21, 1966 – New Year’s Day in Chinese calendar. Start of the year of the Fire Horse in Chinese astrology. March 8, 1966 – A bomb planted by young Irish protesters destroys Nelson’s Pillar in Dublin. May 16, 1966 – The Communist Party of China issues the “May 16 Notice”, marking the beginning of the Cultural Revolution. May 21, 1966 – The Ulster Volunteer Force declares war on the Irish Republican Army in Northern Ireland. July 8, 1966 – King Mwambutsa IV Bangiriceng of Burundi is deposed by his son Prince Charles Ndizi. August 1, 1966 – Purges of intellectuals and imperialists becomes official People’s Republic of China policy at the beginning of the Cultural Revolution. August 22, 1966 – Labor movements NFWA and AWOC merge to become the United Farm Workers Organizing Committee (UFWOC), predecessor of the United Farm Workers. October 17, 1966 – A fire at a building in New York, New York kills 12 firefighters, the New York City Fire Department’s deadliest day until the September 11, 2001 attacks. December 18, 1966 – Saturn’s moon Epimetheus is discovered by Richard L. Walker. Who Were Born On 1966?